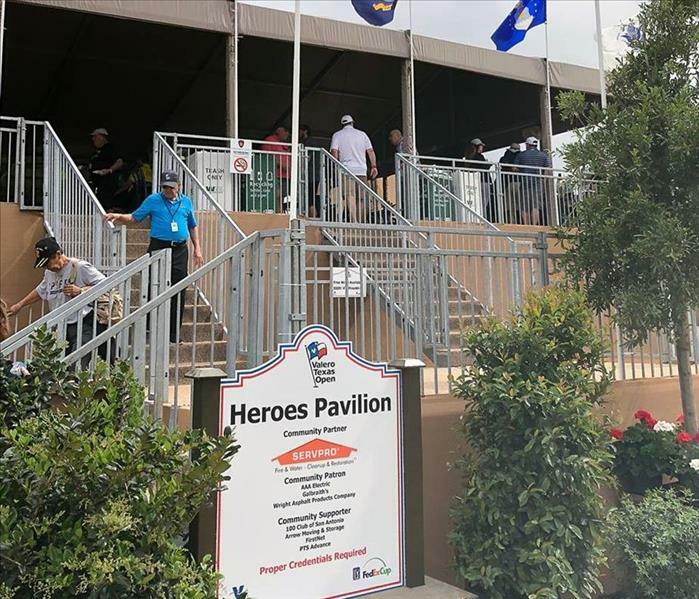 SERVPRO is proud to be in attendance at the Valero Texas Open as a supporter of our First Responders. We're giving them a break from the action on the greens in our Heroes Pavilion. We are truly grateful for our local first responders and all they do. 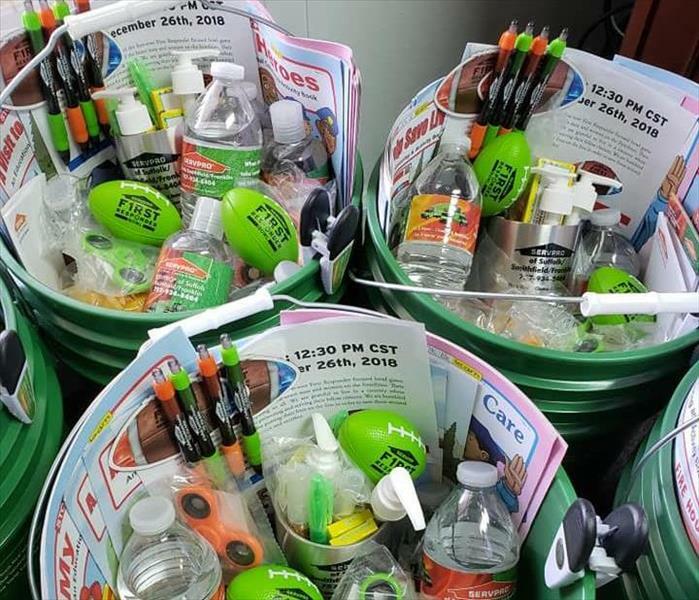 We wanted to give back in some way so we put together buckets with snacks, gifts, waters, coloring books, crayons, and more. Thank you from SERVPRO of Suffolk/Smithfield/Franklin! This is our Marketing Rep, Teresa, pictured with one of Suffolk's finest. 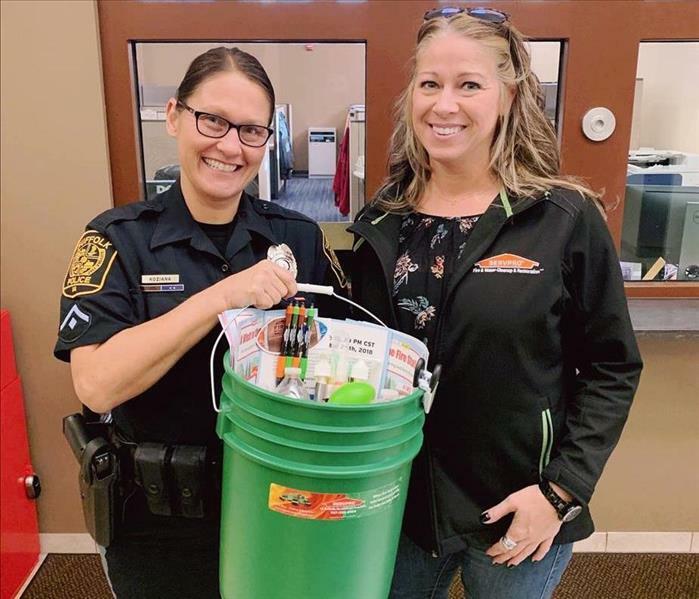 Buckets full of goodies were put together and given out to all local Police and Fire Stations as a small token of our appreciation for all they do. Our crews out at a water loss in Suffolk, VA. These are 2 of our ProMaster vans in our fleet, always packed and ready to go to assist our customers. Call 24/7, 757-934-8404. SERVPRO of Suffolk/Smithfield/Franklin is so proud of our team for a great 2017! Kudos to our team and all our customers for helping us achieve this success. This is our lead technician Shane's work truck on-site at a local house fire in Suffolk. You can see some of the equipment we use daily, ready to go for the next job. 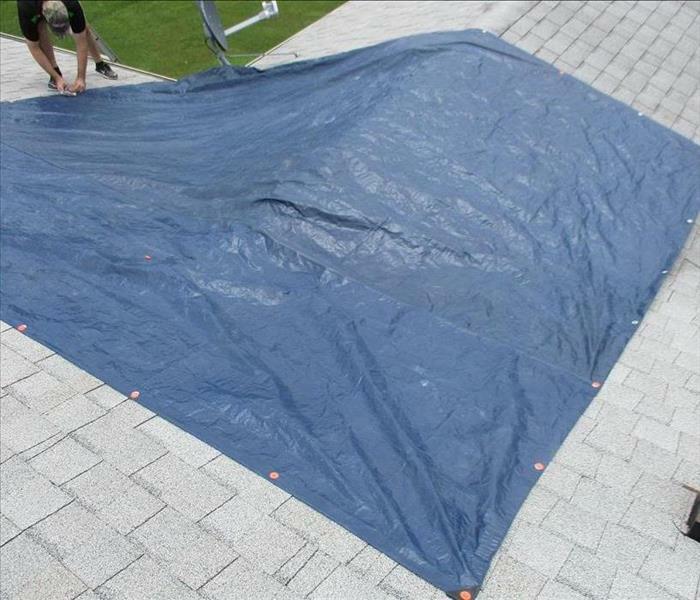 This photo shows a roof tarp being put on by one of our techs after Hurricane winds came thru and knocked a tree into their home. It was a temporary fix to prevent further water damage that was completely repaired within a week. 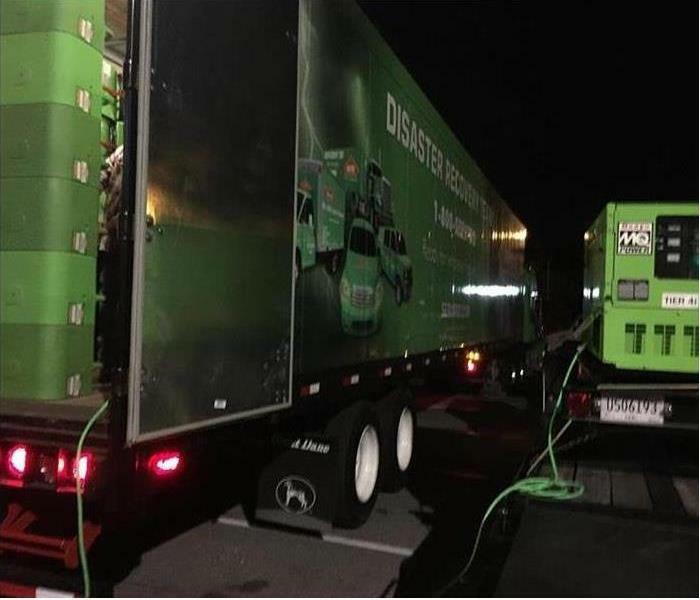 When a storm strikes, our Storm Disaster Recovery teams are available all over the United States to help. Whether you need us for a week, a month or longer, we are available 24/7/365! This photo shows the aftermath of copper heat lines in the customer's home that had frozen and then burst. It was a significant event that caused quite a bit of water damage. 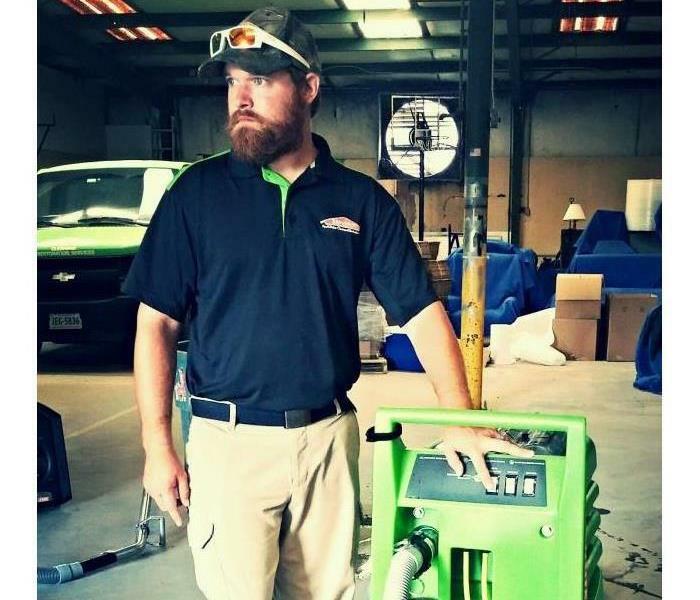 Our SERVPRO team went in and handled everything from start to finish. This is one of our local banks in Virginia that we have done multiple jobs for. This particular one was due to their sprinkler system malfunctioning and causing water damage to several floors. 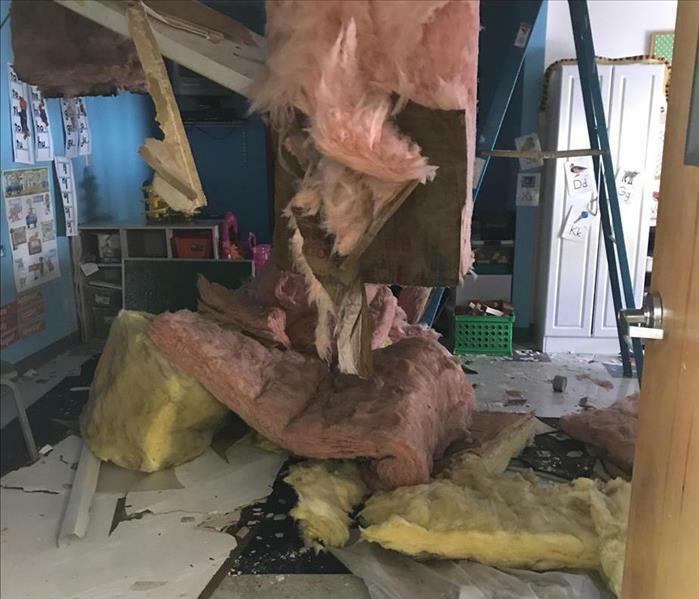 This photo shows the results of a fire in a garage in a home in Suffolk, VA. After the fire was out and the area deemed safe, our team was called in to handle salvage, demo, and repairs. Grease fires can be a very scary situation. This home was seriously damaged as a result of grease left in a pan. Thankfully no one was injured and we were able to salvage some of the homeowner's belongings while restoring their kitchen and home. 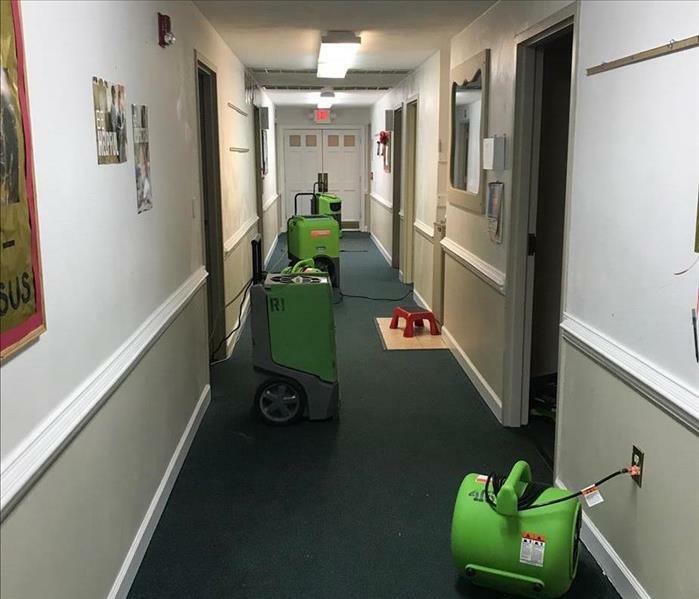 This photo of a room in a local retirement community shows just how much damage water can do and the steps we take at SERVPRO to get the water removed safely and efficiently. 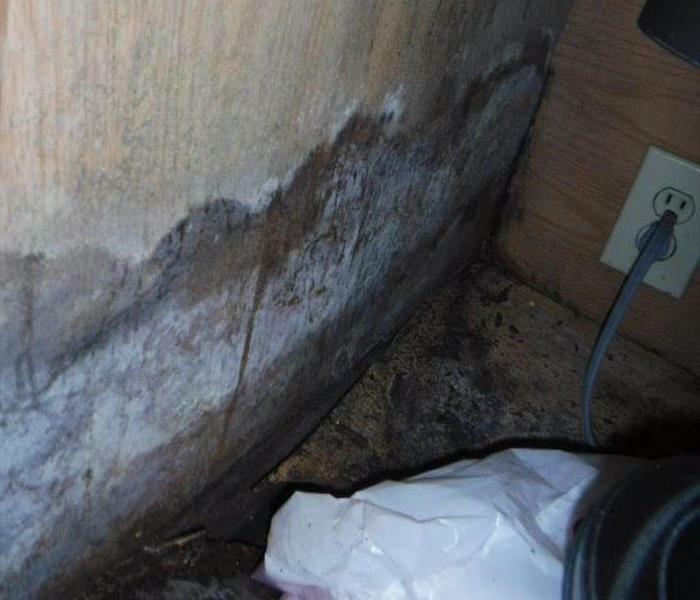 This photo shows extensive mold growth on the cabinets in a local Apartment community caused by an ongoing water leak. 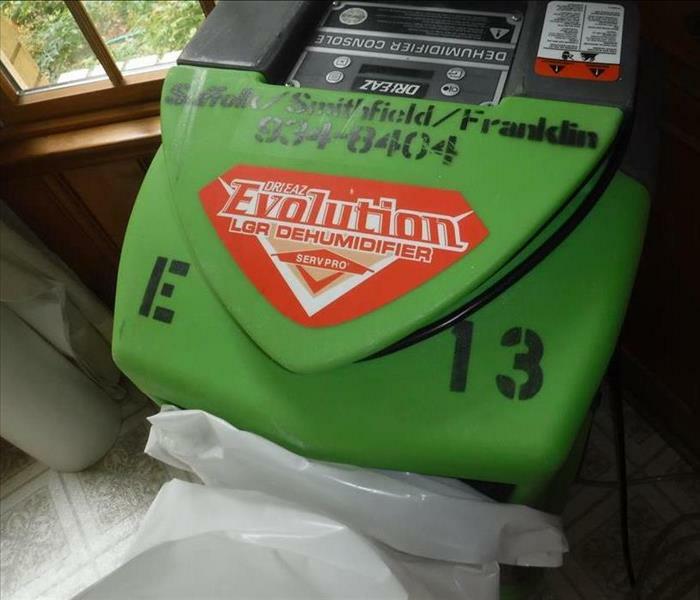 Always be aware of changes in your home and call SERVPRO of Suffolk/Smithfield/Franklin if you find signs of mold growth. 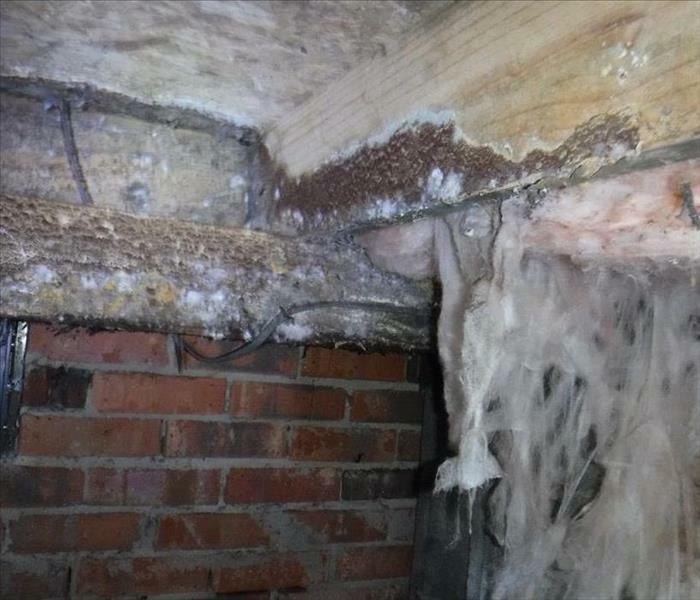 This picture shows excessive mold growth in a home that had been uninhabited for some time. The owners had SERVPRO come in and clean and sanitize the home to be put on the market. This is one of our many dehumidifiers used on commercial jobs and occasionally residential. The Drieaz Evolution Low Grain Refrigerant. It will remove almost 18 gallons of water out of the atmosphere per day. This picture is one of the many affected hallways in a local Suffolk school. They had significant water damage from frozen pipes that burst to cause flooding throughout the school. But with our techs and equipment, they were dry and back in business in no time. This church had significant water damage from multiple frozen pipes in their ceiling. Our team went in with extensive equipment and had the facility and all classrooms back up and running within 2 weeks. This photo shows our equipment in a large church in Suffolk, VA. They had a pipe burst as a result of the winter weather and had significant flooding throughout the sanctuary, hallways, and rooms. This picture shows a customer's roof tarped by our SERVPRO techs after a winter storm with 60 MPH winds came thru and caused damage to the shingles as well as caused the roof to leak. This mansion on the water had a huge water loss as a result of a tankless water heater malfunction in the attic space above the master bedroom. It turned out to be our largest residential job to date. This picture is the living room which was also affected. This home had a frozen pipe burst in their attic, causing major water damage below in their kitchen and surrounding rooms. 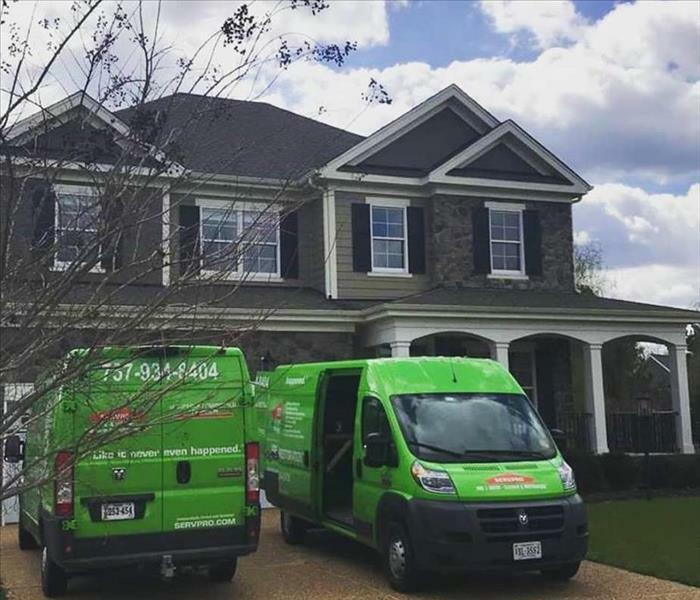 SERVPRO handled the mitigation and repairs and had the homeowners back in their home in no time. Mold resulting from prior water damage that sat under carpet and padding for extended time. 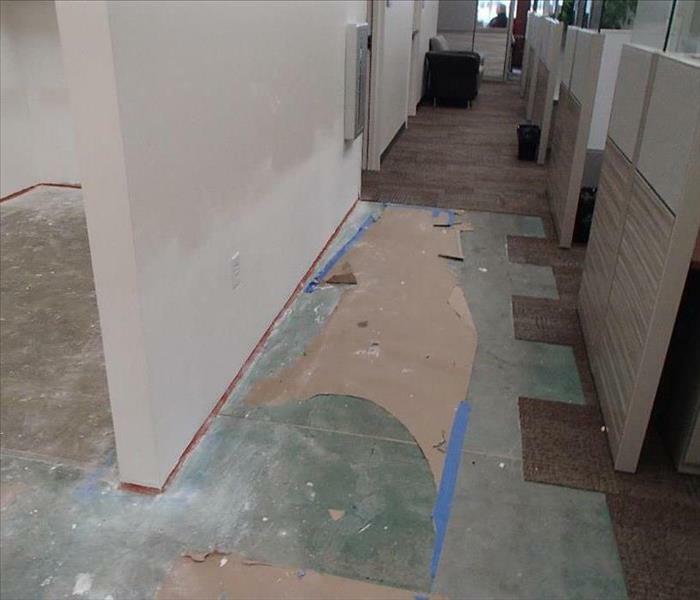 Our SERVPRO techs removed all affected area, ensured all other areas were dry and repaired the floor. This is a result of ongoing moisture damage that our techs discovered. It is an area that can really build up being it is not commonplace homeowners frequent. We went in and mitigated the area along with the repairs. 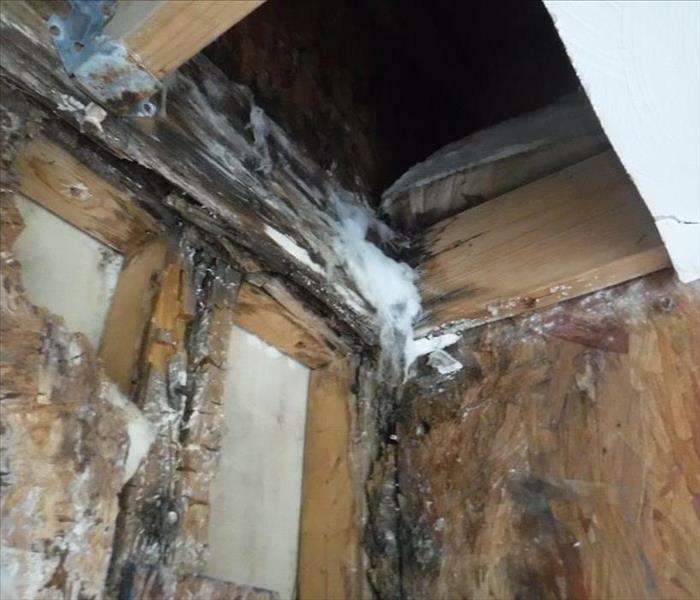 An example of mold growth under a bathroom cabinet as a result of a leak. 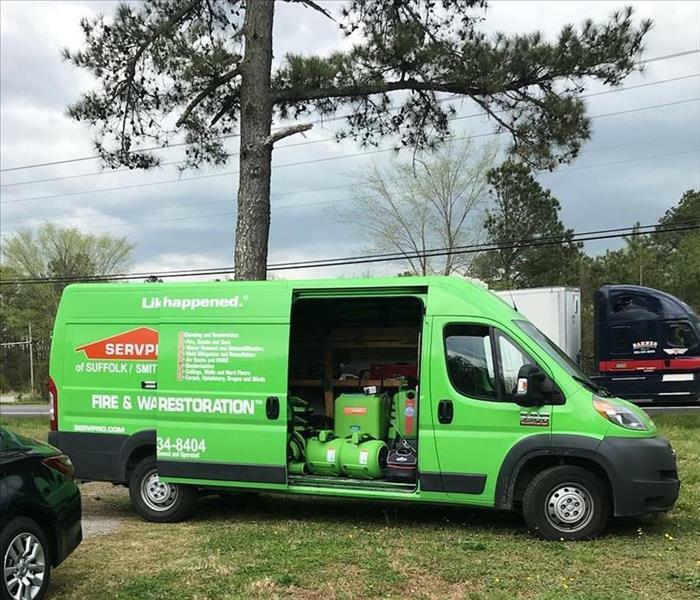 The leak was repaired and our SERVPRO team took care of remediation and repairing the cabinet and surrounding space affected. This is an example of prolonged moisture and the effect it can have if not taken care of at the onset. A customer's home in Suffolk that our team took care of remediation, demo, and repairs for. This photo shows wet/burnt insulation in a home fire that was started by an electrical malfunction. Between the fire itself and the aftermath of the firefighters who fought the blaze and saved the home, there was significant fire and water damage throughout. Our team handled the cleanup, demo, and restoration of the home and all of their contents. This townhome kitchen fire was caused by a tenant attempting to dry his boots by putting them in the oven. Needless to say, that was a big and costly mistake. Nobody was harmed, other than the boots, and our team handled all of the cleanup, demo, and repairs for the homeowner. This home fire was a result of a candle catching a nearby curtain on fire in a child's room. Very scary experience for the customer and thankfully no one was hurt. SERVPRO went in and handled the demo, drying, and mitigation as well as over saw all repairs for the family. This picture is a result of a lamp catching a table covering on fire. It caused extensive damage to several rooms, luckily nobody was harmed. Our techs cleaned and restored the home back to normal while salvaging all possible contents for the homeowners. 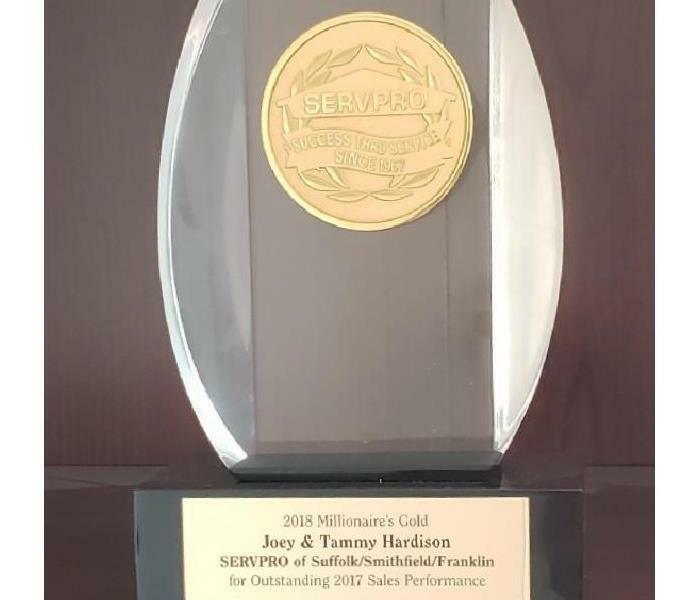 SERVPRO made it "Like it never even happened." One of our large Insurance Agency's that we work with called us with a busted water heater in their offices. Our team had equipment set up throughout so that everyone was still able to work while the drying process happened. They were dry and back to normal within less than a week. This Pizza Restaurant in Carrollton, VA had their staff walk into standing water throughout their establishment after a hose leak in the kitchen. It was a huge mess and inconvenience for them, but our techs had it dry and back in working conditions within 2 days, which made them extremly happy. Our vehicles on site at a huge water loss we are working as the result of frozen/busted pipes. 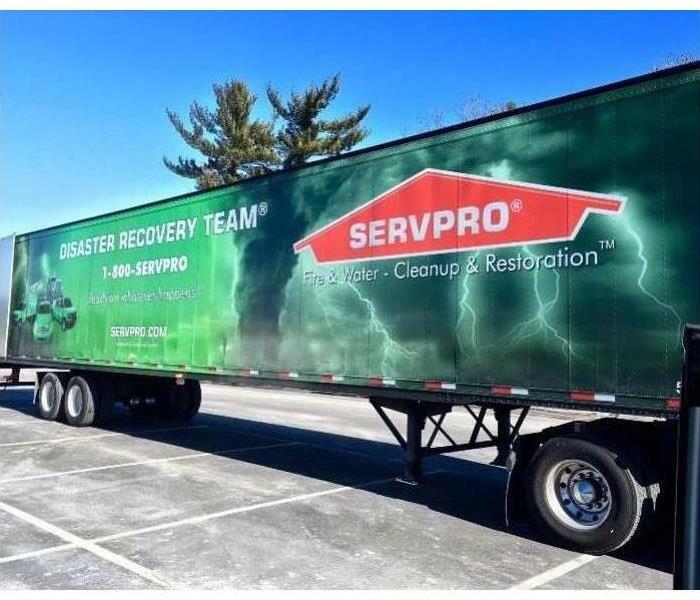 SERVPRO of Suffolk/Smithfield/Franklin is ready to assist, day or night. 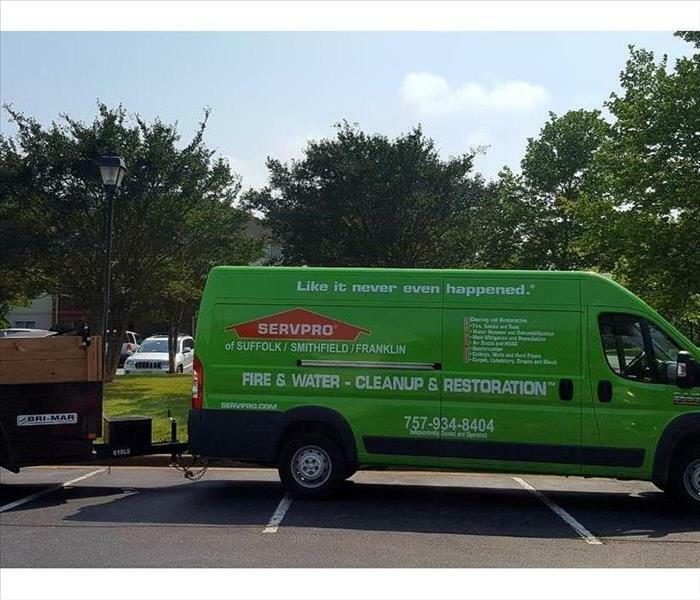 SERVPRO of Suffolk/Smithfield/Franklin is ready to assist you in your commercial large loss disaster. We have the equipment ready and able to handle your large losses. 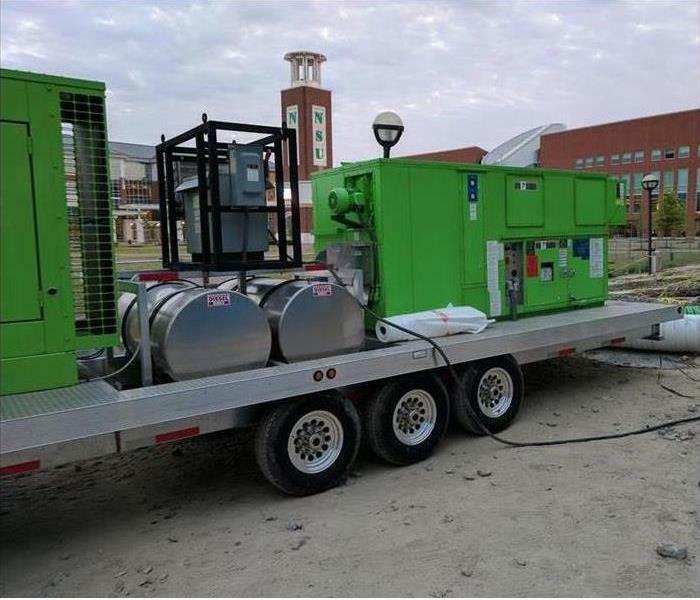 This commercial trailer houses a 5000 CFM Desiccant, capable of drying a medium to large commercial building, and a 150kw Generator. Together, this trailer of equipment can conveniently save both time and money when it matters most. This picture shows just one of the many rooms we mitigated, demoed and repaired in City Hall after Hurricane Matthew. Our crews were in there for several weeks working to make it "Like it never even happened." This photo was captured of one of our vans out in front of an apartment community in Suffolk. They had 2 apartments flooded from a broken sink faucet in the kitchen. The trailer attached was used to haul away all the demo byproduct. 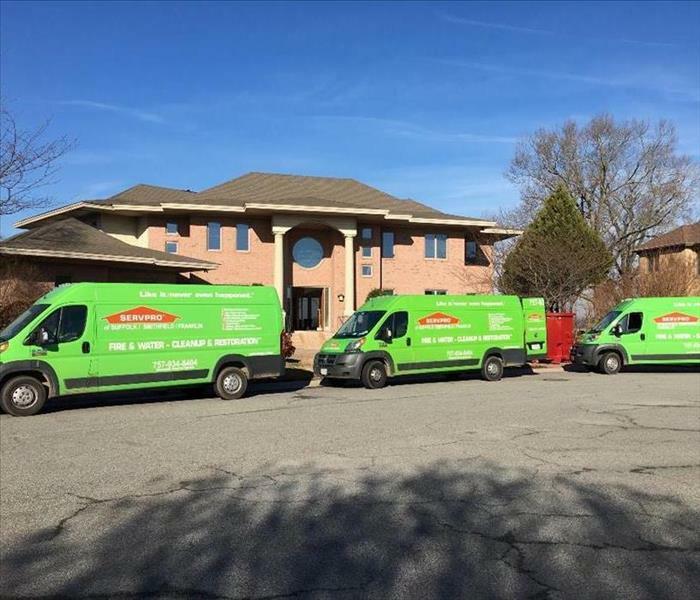 SERVPRO of Suffolk/Smithfield/Franklin is growing! 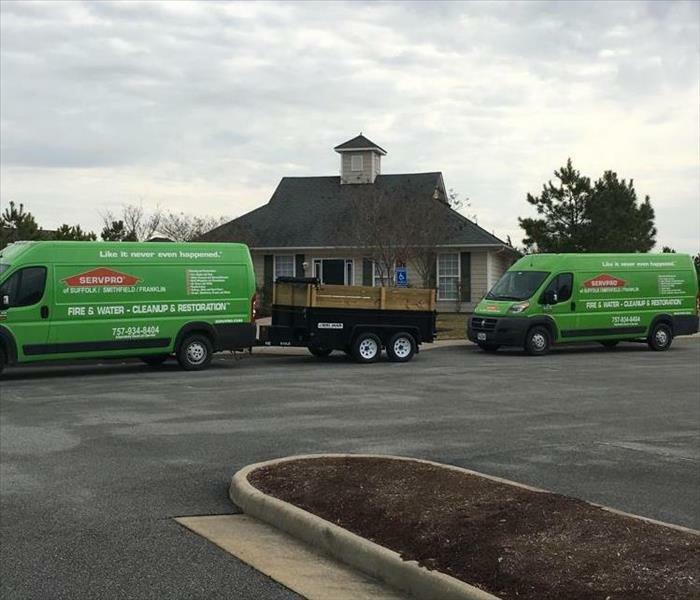 This photo shows our two recently purchased vans on site at a water loss job. Just another way we are ensuring to always be faster to any disaster. Our Lead Technician, Shane Jones, demonstrating the Mega XL portable water extractor for the crews. This machine can empty a 55-gallon trash can in less than 30 seconds. Amazing piece of equipment that our team uses to make disasters "Like it never even happened." Always a fun event to sponsor and participate in! 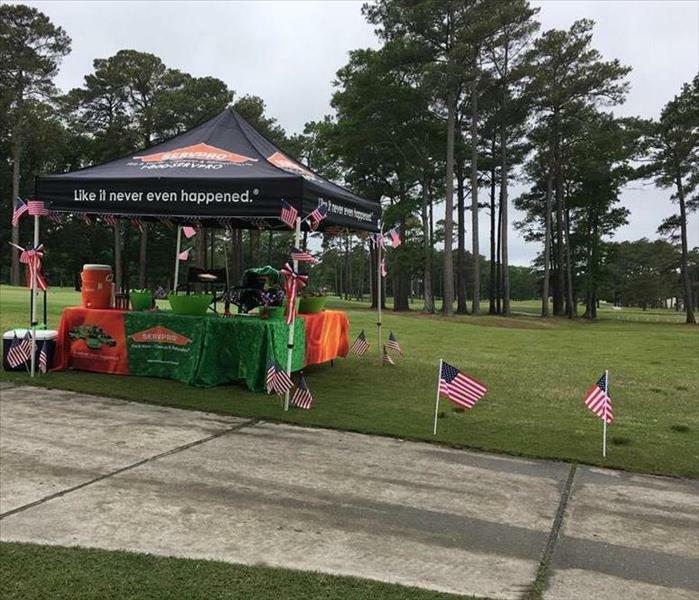 This year we went with an Americana theme at The Hampton Roads Claims Association Golf Tournament being it was so close to Memorial Day. 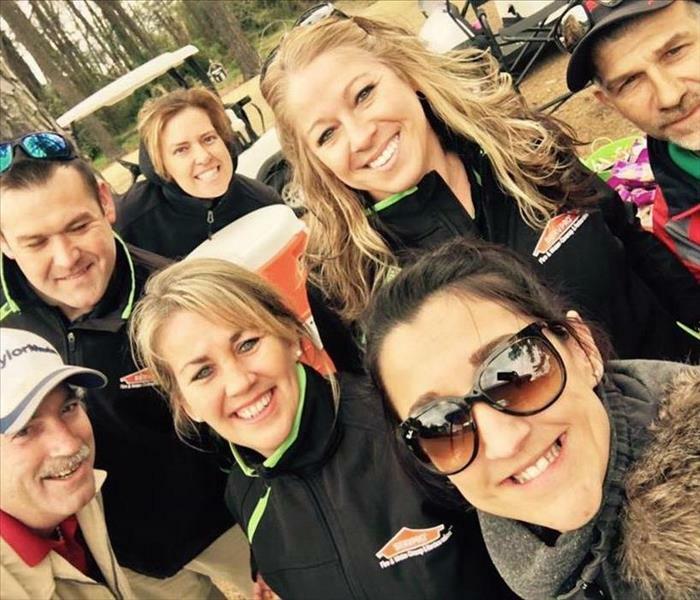 SERVPRO employees along with some of the players showing support at the Blue Goose Golf Tournament which raises money for the Edmarc Hospice for Children. Always a great time for an excellent cause. We here at SERVPRO are very grateful for our first responders. 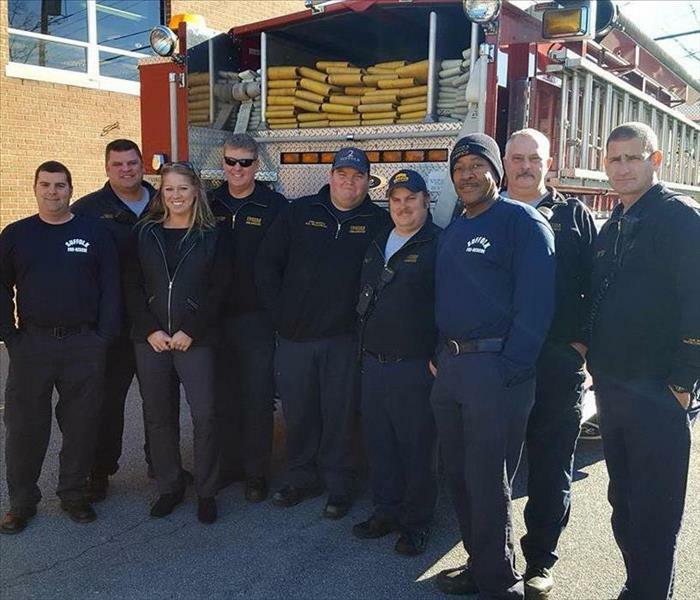 As a small way to say thank you, our marketing rep. provided lunch for the crew at Station 1 in Downtown Suffolk. Thanks for all you do! !